The Honda Accord has been an award-winning, best-selling family sedan for well over 30 years, and continues to be one of the most popular automobiles on the market. 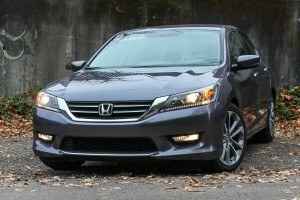 A used 2015 Honda Accord is no different, boasting critical acclaim and winning awards against all other vehicles in its class. Reputation aside, a pre-owned Accord is fuel efficient, has enough power to make any driver satisfied, and enough interior room to keep five passengers more than comfortable. A 2015 Honda Accord used comes standard with the modern benefits you have come to expect from Honda, with cruise control, rearview cameras and impeccable handling. With a combined 7.8L/100km combined in the base model 2015 Accord, you’ll be happy to save money at the pump every time you fill the engine. Whether you’re looking for a comfortable family sedan, a sporty v6 coupe, or something in between, the 2015 Honda Accord used is the vehicle for you.